Chances are that if you mention the film No Way Out to people, they will assume you’re about to discuss the 1987 thriller starring Kevin Costner. It’s a decent movie, but it isn’t a patch on its 1950 namesake. I’d never heard of the film before a newly restored bluray edition landed on my doorstep – and now I’m telling everybody who will listen to seek it out because it’s a real gem. If you are aware of it, chances are it’s because it marked the big screen debut of Sidney Poitier, and is the first in a long line of noble roles – something his career has been dominated by. 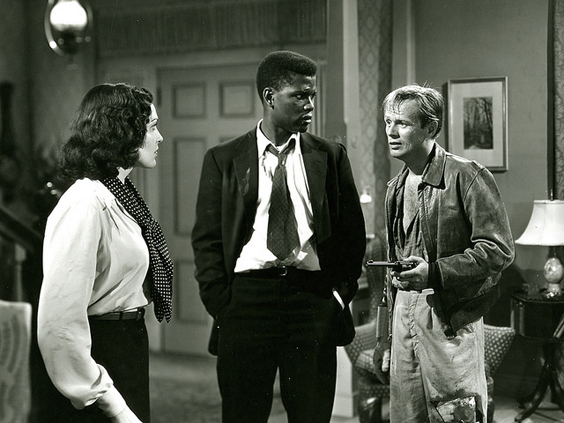 And while Poitier is undoubtedly compelling, demonstrating early promise that would go on to be realised in such hits as The Defiant Ones, Blackboard Jungle and Lilies of the Field, for which he won an Oscar, it’s co-star Richard Widmark who deserves the most plaudits. Widmark is largely forgotten by the public these days, but he was a snarling, menacing presence in a great many underrated movies, including his star-making debut, Kiss of Death. He’s certainly in full-on villainous mode in this classy film noir as Ray Biddle, a small-time criminal who, along with his brother Johnny, is brought to the prison ward of an urban hospital. Both men have been shot by a police officer after resisting arrest. They’re attended to by Dr Luther Brooks (Poitier), a young, recently qualified and earnest medic who realises there’s something other than blood loss wrong with Johnny. Brooks suspects a brain tumour, but as he carries out a spinal tap, his patient dies and Ray accuses him of murder, screaming racial epithets throughout. Ray’s other brother George, a deaf-mute who’s able to gain valuable insights via lip-reading, helps stir up trouble between the town’s working class white residents and their black neighbours, leading to a full-on riot between the two factions. 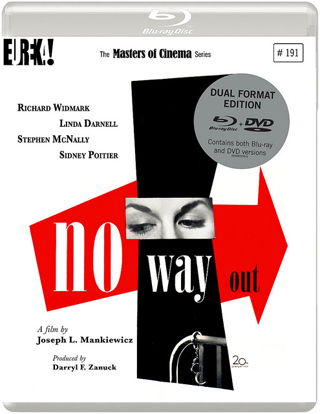 Some may claim that No Way Out is rather heavy handed in its treatment of racism, but we have to remember the time in which it was made. Before the rise of the civil rights movement, this would have been one of the few ways in which liberals could get their views across. It remains hugely fascinating and a credit to all involved, including director Joseph L Mankiewicz, who also co-wrote the screenplay; an in-depth two-part documentary about his life and career is included among the special features.